is a convenient center to serve the entire Bay Area and beyond. and affordable it is to make your aesthetic dreams a reality! the way to get you the amazing results you deserve! the amazing before and after pictures of Dr. Mosser’s real patients! Or call us today (415) 398-7778! 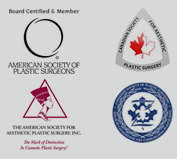 San Francisco Plastic Surgeon Dr. Scott Mosser, a Board-Certified Plastic Surgeon, is pleased to welcome you to this official site for our practice serving the San Francisco Bay Area. Our Union Square location is a convenient center to serve the entire Bay Area and beyond. Your decision to undergo cosmetic surgery is personal and very important. Dr. Mosser listens and educates. He supports his patients in making their decision with an informative process that includes a thorough discussion of the available options. You will be empowered with the information it takes to make the right choices, confident about the procedures from the very start, and constantly aware of the support that our office provides. Dr. Mosser is not only fellowship-trained in general plastic surgery, but spent a year mastering his surgical techniques by undergoing a further Aesthetic Fellowship in Plastic Surgery. San Francisco Bay Area residents and even many patients from out of the area benefit from the countless hours Dr. Mosser has spent working with patients in achieving their desired results and improving their lives. When you are ready for rhinoplasty, tummy tuck, breast augmentation surgery, liposuction, breast implant revision, blepharoplasty, facelift,Botox and other cosmetic surgeryprocedures, or if you have a question about saline breast implants or silicone breast implants — San Francisco Plastic Surgeon Dr. Scott Mosser is your premier choice. Center, Saint Francis Memorial Hospital, and Saint Mary’s Hospital in San Francisco. Dr. Mosser has dedicated himself to his patients, and strives to remain at the front of the changes and new technologies of plastic surgery. 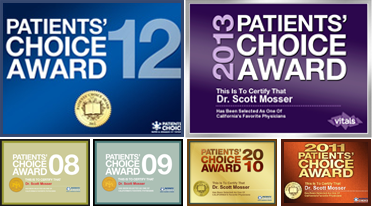 Dr. Mosser has been voted top rated by patients 5 years in a row!